For left handed shooters, some pistols will be more user-friendly than others. Significantly more people are right-handed in the world. Due to the predominance of right-handed people, many aspects of life are organized and designed toward those favoring their right side. Shooting a pistol is no different, with many weapons being better suited for right-handed people and many trainers being more accustomed to working with shooters firing from the right side. Paul Castle and George Whitfield, the Chief Instructors for Sabre Tactical Training, estimate that nine out of 10 people are right-handed. This statistic makes it highly unlikely that many conventional pistol shooting techniques and products are going to account for the left-handed person. Therefore, many left-handers are going to have to adapt to existing options. In addition to being forced to adapt to a right-handed world, left-handed people have been a source of prejudice and mistrust for centuries. The left hand has been associated with being the side of the devil, and the word "left" comes from the Anglo-Saxon word "lyft" meaning "weak" or "broken." Left-handed shooters tend to organize their shooting style in the opposite fashion of standard right-handed people. 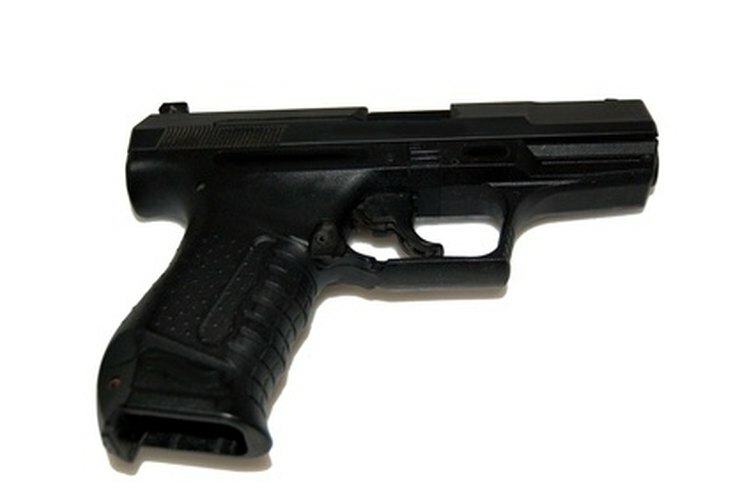 A left-hander will carry his pistol on his left side and his ammunition clips on the right, essentially resembling a mirror image of a right-handed fighter. The United States Marine Corps reflects this tendency in its pistol training manual, specifying that left-handed Marines should reverse all instructions in the manual. For the left-handed shooter, some pistol types are more effective than others. Gun Week author R.K. Campbell suggests that left-handed shooters choose semi-automatic pistols, due to the easier access of their safety and magazine releases, especially on modern Beretta, Browning and Smith and Wesson models. Left-handed shooters have a number of advantages over more orthodox shooters. Since left-handed people are forced to cope with right-handed practices and equipment, they are more capable of adapting to varied shooting conditions and circumstances. Left-handers also have an advantage when shooting semi-automatic weaponry against a barricade, because the side ejection port on the pistol faces away from the barricade, ejecting the empty cartridge freely. For right-handed shooters leaning against a barricade, the empty cartridges may bounce back into the ejection port, jamming the gun. For left-handed people shooting in a right-handed world, many will have to cope with equipment designed for righties. Some guns are designed with neutral handling in mind, but they remain a small percentage. Therefore left-handers can follow a few tips to make shooting more friendly. Specially ordering pistols with left-handed shooting in mind is possible, but R.K. Campbell suggests choosing pistols and holsters with more friendly left-handed access. In competition shooting, keeping the left-hander on the left side of the team will offer the shooter the full range of ability.